A few years ago, I started my distance Master's program at Aston University. When I took a module on Teaching Young Learners, one of the recommended textbooks was Annamaria Pinter's Teaching Young Language Learners. This book is a very helpful resource for anyone who teaches languages to children. 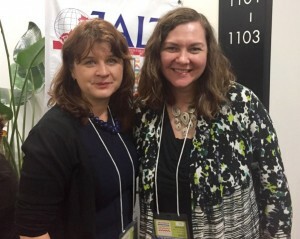 So, I was very honored to have the chance to interview her when she came to Nagoya to give a plenary speech at the JALT International Conference. She spoke about why there is a lack of research on young learners in EFL, how teachers in Japan can modify teaching ideas from Europe, and how returnee students can be a valuable asset in the classroom. It was truly the chance of a lifetime to be able to ask this leader in TEYL anything I wanted!